San Jose Searching For Answers To Stop Stone And Co. Through four games of the series, the San Jose Sharks have iced 14 different forwards, seven different defensemen, and two goalies. Only four of those 23 players have yet to be on the ice for a goal by Mark Stone, Max Pacioretty, or Paul Stasnty. The Sharks have tried multiple forward lines, they’ve rotated defense pairings, they’ve tried checking lines, skill lines, speed lines, superstar defense pairings, and defense-first pairings. Nothing has worked. 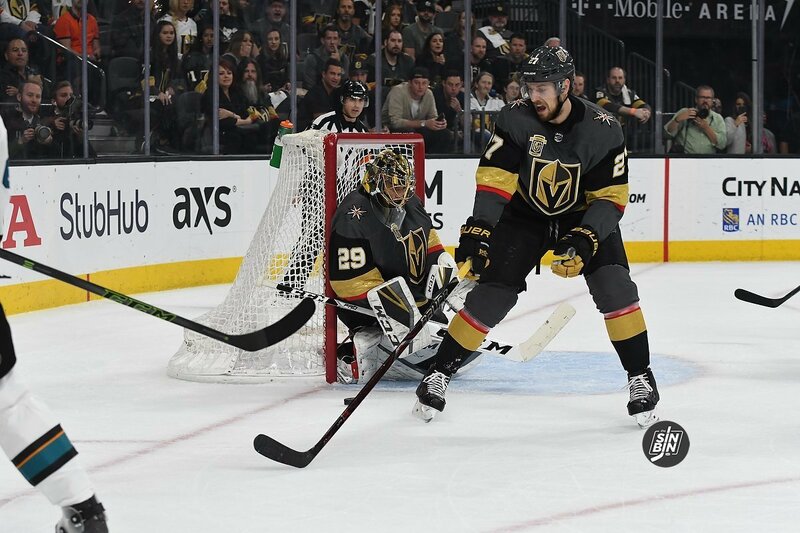 The Golden Knights line of Mark Stone, Max Pacioretty, and Paul Stastny have scored 12 goals, tallied 28 total points, and they’ve done it on just 34 shots. With every series now having four games finished, Stone leads the league in playoff goals, Stastny leads in playoff assists (tied with Pacioretty), and Pacioretty (tied with Stone) leads in playoff points. The player who has spent the most time on the ice against the Golden Knights dominant line has been Erik Karlsson. Despite being one of the best defensemen in the entire NHL, Karlsson has not been able to handle the pressure of Stastny, Stone, and Pacioretty. He’s been on the ice for 11 of their 12 goals. 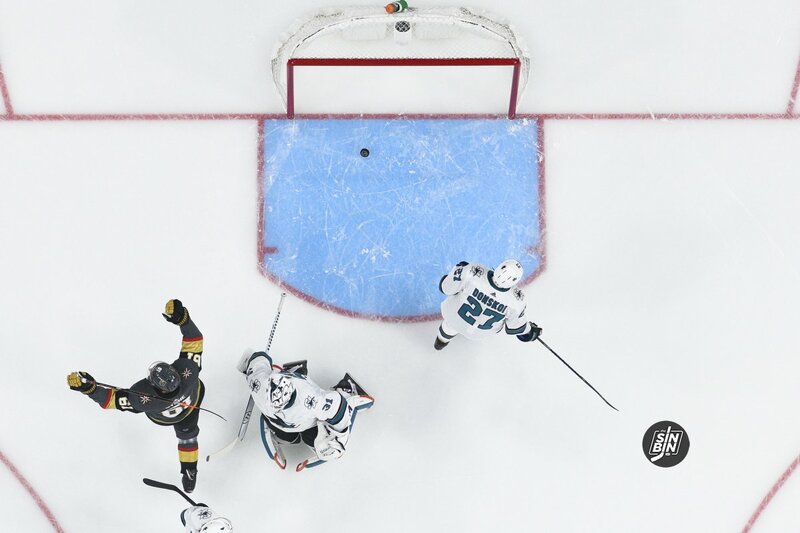 Overall, Karlsson has been out there for 13 of the Golden Knights 18 goals in the series, the same number as goalie Martin Jones. The Sharks have another chance to try and crack the code tonight, and they’ll likely try something new once again, but if you ask Mark Stone, no matter what the Sharks do, that line believes it’s just a matter of keeping it simple. As far as the defensemen, they have a simple plan too. One more dominant effort from the line of non-Misfits, and the Golden Knights will have ridden them right into the second round. 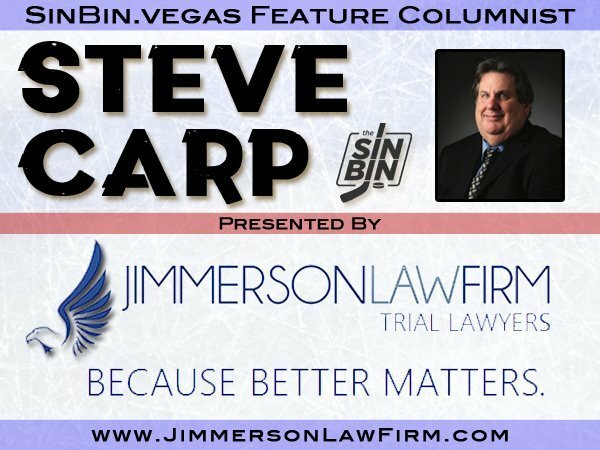 Before the opening-round playoff series between the Golden Knights and the San Jose Sharks had begun, I pointed out that Vegas would win and it would do so because of superior goaltending. Hey, I’m no Scotty Bowman, but you didn’t need to be to know that Marc-Andre Fleury was better than Martin Jones and/or Aaron Dell. 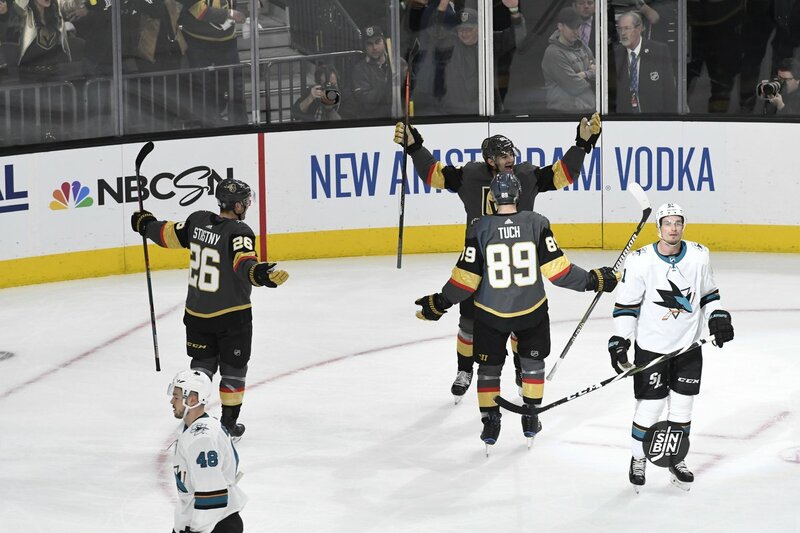 And as this series heads to SAP Center Thursday for what could be a series-ending Game 5 following an impressive 5-0 victory at T-Mobile Arena Tuesday night, it’s a fact Fleury has been a big part of why the Knights hold a 3-1 series lead. He’s getting better with each period of each game. He wasn’t great in the 5-2 loss to the Sharks in Game 1. And after letting in three late first-period goals in Game 2, Fleury has been virtually unbeatable. I’m not blaming him for the loss or the trio of goals allowed in Game 2. But he’s doing what you want your goalie to do — stop the easy ones, make a few spectacular saves, be the first line of defense on the penalty kill and keep your team in the game. He’s tracking the puck with laser precision. He’s always a step ahead of the Sharks in anticipating where the play is going to be. His positioning is spot on. And he’s moving well in his crease and post to post. In other words, Fleury is being Fleury. He stopped all 28 shots he faced in recording his 15th career playoff shutout, tying Chris Osgood for fourth place on the NHL’s career list. 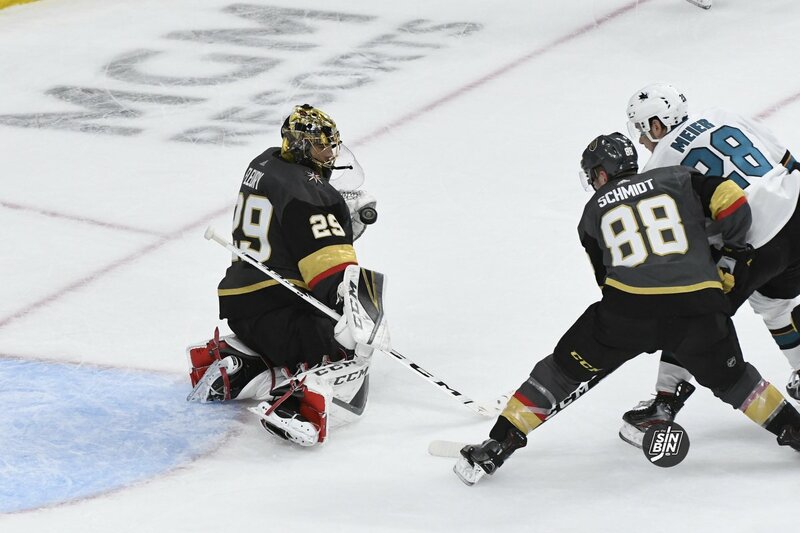 The win, Fleury’s 78th in the playoffs, moved him past Mike Vernon into seventh place on the all-time list for goaltender wins. Next is Ken Dryden, who had 80 postseason victories. Patrick Roy is the career leader in playoff wins with 151. His play Tuesday did not go unnoticed by his coach, his teammates and his opponent. And San Jose coach Peter DeBoer tipped his hat to Fleury. The Knights have done an awful lot of things well in this series. 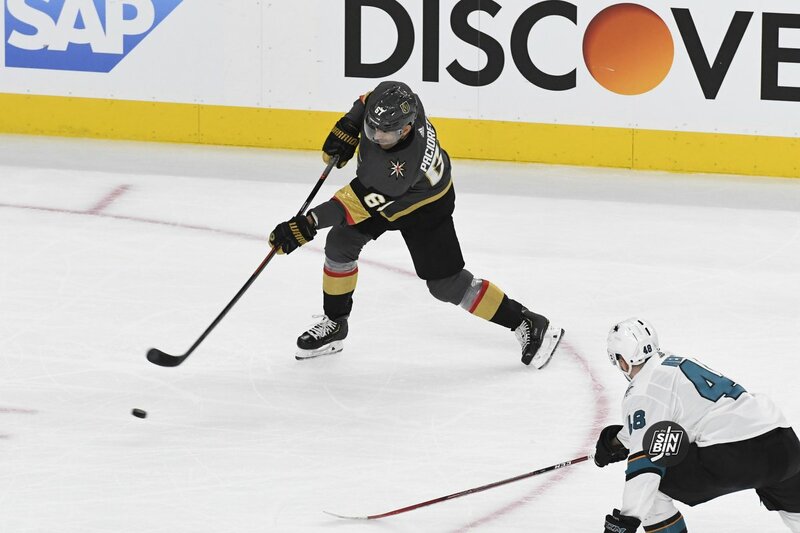 The line of Paul Stastny, Max Pacioretty and Mark Stone have dominated and the Sharks still haven’t found an answer for them. They’re doing the little things well, like winning faceoffs. They’re outhitting the Sharks. What Vegas has not done well is avoiding penalties. They’re taking way too many, and it’s going to catch up with the Knights. Maybe not in this series, but perhaps in the next round. 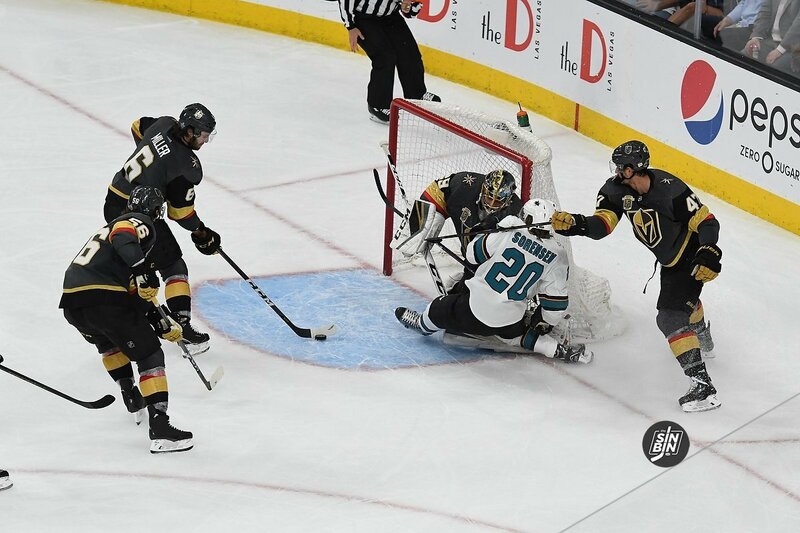 Fleury has been tremendous in standing up to the barrages of shots the Sharks have fired at him when they have the man advantage and that’s what you hope your goalie will do. Tuesday, San Jose went 0-4 on the power play and they are just 3 for 20 in the series (15%). You’re the road team in the Stanley Cup Playoffs. Your main objective is to get a split and take home-ice advantage away from the other team. 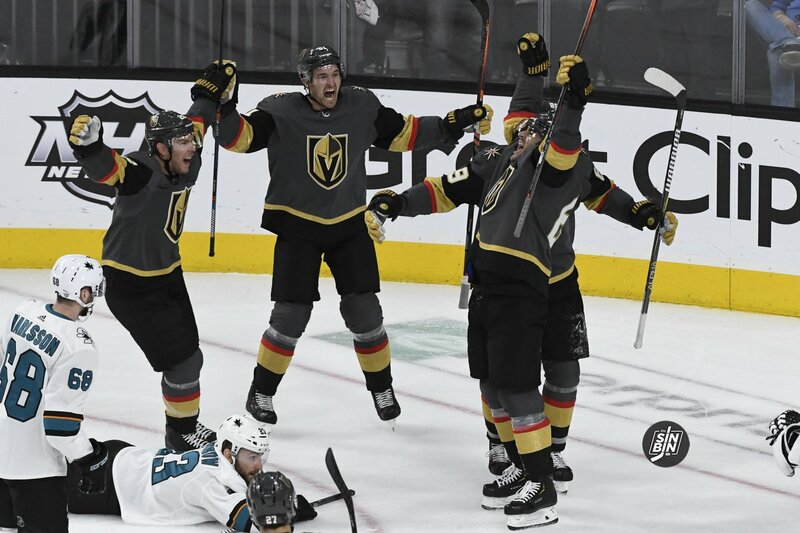 The Golden Knights got what they were looking for, splitting the first two games of their opening-round series with San Jose. 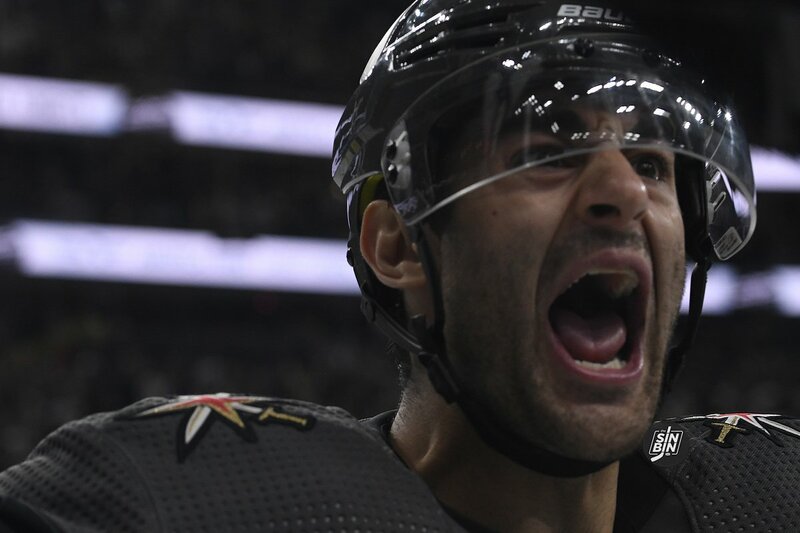 It is now a best-of-five series with three of those games potentially at T-Mobile Arena, where you can expect a frenetic crowd both inside and outside the building. As for how the Knights got the split can come into question and leave pause for concern heading into tonight’s Game 3. There are so many obvious points: mainly stay out of the penalty box and don’t turn the puck over in your end. You know that, so there’s no sense in belaboring the point. Give Vegas credit for not completely folding after squandering a 3-0 first-period lead. The Knights showed some resiliency in regaining command of the game and eventually posting the 5-3 victory Friday. The Knights may very well go on and win the series and advance to the conference semifinals. But they’ve got a few things to clean up in Game 3 in order for that to happen. San Jose continues to try and take liberties with Marc-Andre Fleury and the Knights’ skaters need to send a message to the Sharks that it won’t be tolerated. Especially when Evander Kane is looking to stir the pot. Kane is so talented but he plays with a certain edge that sometimes crosses the line. He needs to be accounted for. Same with Timo Meier who has no problem crashing the net and getting in Fleury’s face. Ditto Joe Pavelski, Barclay Goodrow, Logan Couture, and Michael Haley. If you’re a Golden Knight and you’re going to beat the snot out of someone who messes with your best player, I can live with that kind of penalty. Fleury is your most valuable commodity. You can’t let the other team have carte blanche and run at him whenever they feel like it. I see Jonathan Marchessault always willing to come to the aid of his goalie. Marchessault is one of the smallest players on the roster in terms in size. In terms of heart, he’s one of the biggest. Marchessault said it’s the responsibility of any Golden Knight who is on the ice to protect Fleury. Fleury doesn’t believe the Sharks are out to hurt him. But he knows they are trying to make things uncomfortable and try and get him off his game.